I've always wanted to make my own vinegar. It always seemed as though it was something out of my reach - a project that required more skill or time than I would ever have. That's what I get for assuming! After a little research, I discovered that this stuff isn't hard to make at all (in fact, it couldn't be simpler) and the time required to produce it isn't all that bad either. We found ourselves at the restaurant with nearly six gallons of fresh apple cider, that if not used soon, would undoubtedly go bad. No bueno. Something must be done with it...how about vinegar! A perfect opportunity has arisen! The liquid in question (cider, wine, fruit juice, etc) must be transferred to a large nonreactive (plastic or glass) open mouthed container. 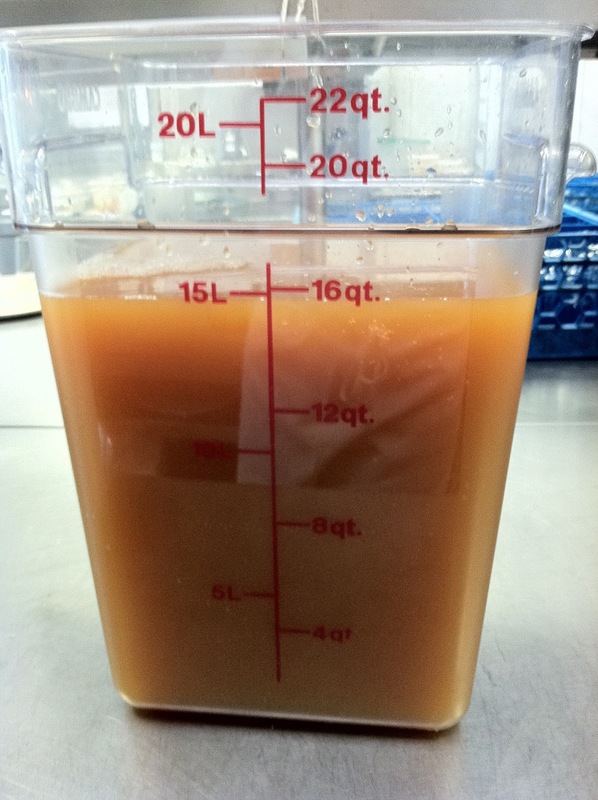 This way you'll have the most surface contact with the air (and oxygen), a very important detail to vinegar making. Unless the air around you is teeming with natural yeasts (maybe yours is), you'll need something to get your vinegar's fermentation started. A "jump start" if you will. 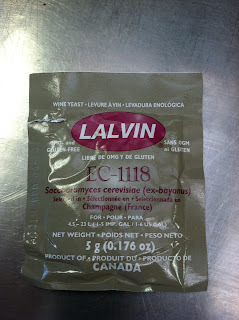 I picked up this wine yeast online for 60 cents! It's enough to ferment 6 gallons of liquid. 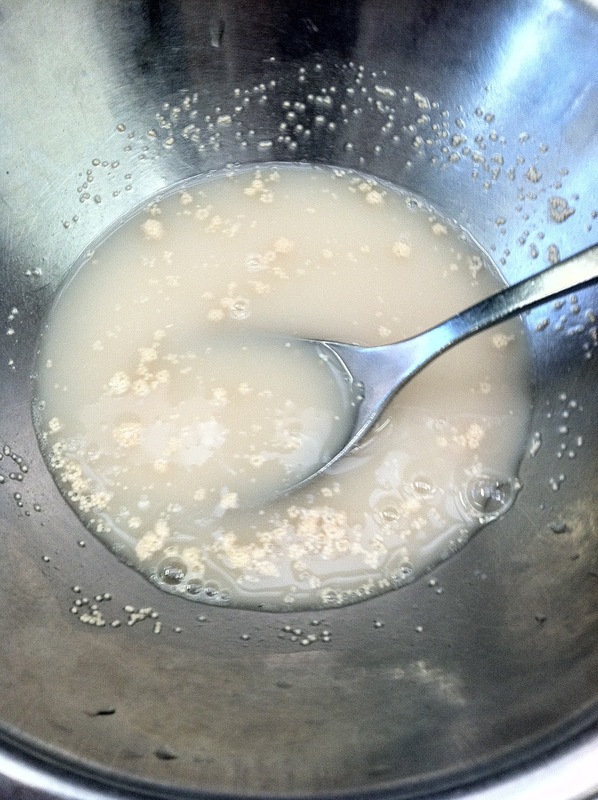 Bread yeast is not recommended for vinegar making. When the time comes to pick your yeast, take a good look around. Many supplier carry yeasts specifically designed for making fermented ciders and other fruit juices. Choose the yeast that will best enhance your end product. This particular strain of yeast, EC-1118, is a variety taken from the Champagne region of France - it is therefor perfect for fermenting at cool temperatures (ie: NY) and best for sparkling wines, fruit wines, and ciders. Activating the yeast is simple. Just hydrate the 5 grams of dry active yeast in 2 oz of water about 100 degrees F. Allow the yeast to bloom for 15 minutes. At this point, you're ready to add your starter to the fermentation liquid. Pour the starter in, and stir well. Cover with a cheesecloth (remember, oxygen contact is important) and label with the date. Keep in a clean, sanitary environment between 60 and 80 degrees F.
The vinegar must be stirred daily for about 3 months. At that point, you can check the vinegar for acidity and flavor. Depending on how bracing you want the vinegar to be, you may choose to let the vinegar ferment for another month or so. When you've decided that the vinegar is correct, it's important to halt the fermentation process by removing the "mother". The "mother" is the yeast that continuously feeds your ferment - it will be in the form of a slimy, cob web looking mass that floats to the surface. Simply skim it off, and clarify your vinegar - the easiest method is to pass it through a few coffee filters. And that's it! Not bad at all huh? Initial prep time of 15 minutes, and less than one minute daily. In three months time, we should have some really nice homemade vinegar. Now, when a Steinbeck aficionado asks you "How ya keepin yourself?" You'll actually be able to reply "Full of piss and vinegar." Why not? It's not often you get to say something like that! Make an alegar next! So amazing what comes of "stale beer". Also a favorite technique of mine is to add apple/pear scraps (especially the peels!!) to the base the day before adding your mother. Strain out all the scraps to prevent rotting.